In Hungary in the years following the end of WW2, a young boy concocts a fantasy ideal of his father who has been killed in the war. In the boy's fertile imagination, the father attains mythical and heroic qualities. 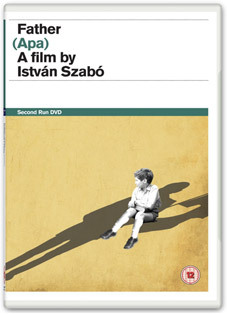 Father / Apa (1968), the second feature to be directed by István Szabó́ (the Oscar-winning director of Mephisto, Colonel Redl and Being Julia), combines humour with a poetic nostalgia, relating historical events through the prism of personal experience to produce a film of extraordinary warmth, intimacy and power. Szabó's poignant cinematic ode was chosen by Hungarian critics and writers as one of the best Hungarian films of all time. Father also boasts luminous monochrome cinematography by the great Sándor Sára, whose films as cinematographer include the 1971 Szindbád, recently released on UK DVD by Second Run, and the Hungarian Film Critics Award-winning Sodrásban (1964). It has been described by freelance film writer and East European cinema enthusiast Michael Brooke as "Szábó́'s superb second feature, a major prizewinner at the time... shot and edited with all the effervescent brio of early Truffaut." Father will be make its UK DVD debut on 22nd August 2011 courtesy of Second Run at the RRP of £12.99. Boasting a new digital transfer with restored picture and sound, approved by the director and new and improved subtitle translation, the release will also include a booklet featuring a new essay by author and Hungarian cinema expert John Cunningham.